MFA, author of the young adult novels Jersey Angel (Wendy Lamb Books, 2012) and Rosie and Skate (Random House), which was selected for The New York Times Editors’ Choice list and Booklist’s 2009 Top 10 First Novels for Youth. 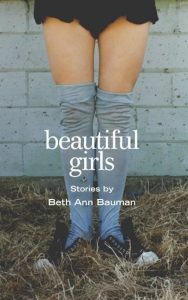 Ms. Bauman also is the author of the short story collection Beautiful Girls (MacAdam/Cage). The acerbic Flannery O’Connor wrote, “…there’s a certain grain of stupidity that the writer of fiction can hardly do without, and this is the quality of having to stare, of not getting the point at once.” It seems to me the writing process requires of us, above all, patience and a willingness to work without immediately knowing what it is we’re saying. This state of uncertainty can be troubling, akin to rowing an old, weathered boat on open seas and losing sight of land. But often the best writing is born under such conditions. We follow our intuitions and inspirations; we row on; we squint into the distance, seeking the horizon. We explore, so that our words might teach us what it is we know. Writing should be an act of discovery for both the writer and the reader.